Hey everybody, it’s Emily from Build Your Library! Now that I have your attention, here are the details on those and a couple other bits of information. As we ease into the holiday season, rest assured – there is still plenty going on with Build Your Library. Here is our fourth monthly newsletter to keep you up-to-date. OH MY GOODNESS, Is it already that time of the year?? Well, here it is – take 20% all of our products during our back-to-back Black Friday Week Sale from Nov 19-25, then our Cyber Monday week sale from Nov 26-Dec 2 – to include all full-year programs, unit studies and previous month Family Reading Crates! In the past we have used “cranberry” and “sugarplum”, so to keep in tradition, this year use the code FIGGYPUDDING in your shopping cart (same code, both weeks). We will send out an additional reminder a few days before the sale ends. 2. Mix all ingredients together into a large bowl (including liquid from soaked fruit). 3. Spread batter into loaf pans and bake until a toothpick inserted comes out clean and loaf is a golden brown – 45 min. to one hour. Cut pieces and let sit until room temperature before eating. The alcohol “cooks out”, so it would be safe for your child. Adults make like to splash with some fresh rum before enjoying. 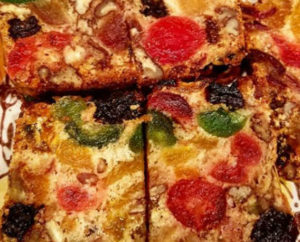 If you are not a fan of standard store-bought fruit cake, you may be pleasantly surprised with this recipe! Speaking of unit studies on sale, at long last, the 6th installment of our Harry Potter Unit Studies series is ready for purchase! Once again journey back to Hogwarts for Harry’s sixth year. This is one of my favorite books in the series because I love getting Voldemort’s backstory. This unit includes a Hogwart’s Course (for Muggles!) – this time you will be studying Potions, a study of the Periodic Table of Elements! This unit takes 3 weeks to complete and is appropriate for ages 10 and up. As always, I’m including four books in our holiday-themed box – a picture book for younger children, a middle-grade family read aloud, a book for older readers, and a book for you, the parent! These books are handpicked by me so that you are all reading quality literature. As always, every crate will include a booklet with discussion questions and rabbit trail ideas, as well as a link to a page on our site with additional links, booklists, movies and documentaries, and printable activities to go along with the books. We significantly decreased the available amount of this “seasonal topic” crate. So if there are any left, please don’t wait too long. We can not guarantee to have any extra of these like our other boxes. We’ll be packing and shipping the December boxes very soon, so order yours today! The January 2019 Family Reading Crate will go on sale for pre-order on December 3rd. Looking for a great holiday gift idea? How about a Family Reading Crate for a whole family of readers? We still have plenty of our past month’s crates available (May – November), currently on sale. You can purchase the crate and have it shipped directly to your recipient with a note inside telling them who it is from. Or we can ship it to you and you can wrap and place it under the tree. Let us know, and we can cover the package in brown kraft paper for mailing, to help protect the box from getting marked up or dirty during shipping, and the USPS mailing address label will not be stuck to the actual box. We always have our Social Media “chicklets” at the bottom of our newsletters and webpage, but we wanted to make sure you are following us on our other platforms. The Build Your Library Facebook is our go-to social media site, and we post there frequently with cool Amazon products and book recommendations we think you would like, as well as all of our Family Reading Crate announcements, blog posts, full year and unit study product releases and updates, and more. Our Build Your Library Instagram page regularly posts pictures and insider info about what I’m currently working on or what I’m doing with my kids. Although not 100% exclusively Build Your Library related, our Arrrgh Schooling YouTube channel has videos about books and homeschooling – but let’s be honest – it’s mostly books. If you want to see unboxing videos for the Family Reading Crates or just want ideas for books to read (either for you for your children) you are sure to find something useful! 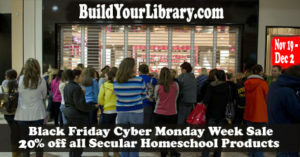 We also have a BYL Twitter feed where I share links and information about BYL and homeschooling. I think that is about all for this month. Again, please follow us on whatever social media you frequent, there will be periodic updates posted there as well, but we will try to keep everyone in the know where ever you are surfing!